Top intelligence community officials warned Thursday that the United States faces the highest terrorist threat level since the 9/11 terror attacks, citing a record-breaking increase in the flow of foreign fighters to Syria and Iraq, as well as joint Iranian-North Korean plans to boost "attack capabilities" and other efforts by leading terror groups to increase their offensive capabilities. As Iran "continues to be the foremost sponsor of terror" across the globe, ISIS has emerged as the "preeminent global terrorist threat," with its combined strength now exceeding al Qaeda’s, according to Director of National Intelligence James Clapper, who warned lawmakers on the House Permanent Select Committee on Intelligence that "unpredictable instability has become the new normal." The United States has never dealt with this type of threat landscape and struggles to ensure it can continue gathering intelligence on these terror groups, which have shown unprecedented proficiency at obfuscating their actions. Violent extremists now operate in 40 countries, Clapper said. Another seven countries have collapsing governments, and 14 are in danger of falling due to violent instability. An additional 59 countries have been marked as facing "significant risk of instability through 2016," Clapper said. Instability in these countries could enable them to become terrorist safe havens, as has been the case in Syria, Clapper said. "There are now more Sunni [Muslim] violent extremist groups, members of safe havens, than any time in history," Clapper said, noting that the rate of foreign fighters now traveling to Syria and Iraq is "without precedent." At least 38,200 foreign fighters, including 6,900 from Western countries, have made their way to Syria from about 120 different countries since the Syrian conflict began in 2012. "Returning foreign fighters [to Europe and elsewhere], with first-hand battlefield experience, poses a dangerous operational threat," Clapper said, citing last year’s massive terrorist attack in Paris. Meanwhile, threats from global pandemics such as the Zika virus also threaten the U.S. homeland. The U.S. intelligence community expects up to 4 million Zika virus cases in just in the Western hemisphere, Clapper said. Officials said that as the United States and other countries implement the Iran nuclear agreement, the Islamic Republic strengthens its alliance with terrorist groups and rogue nations such as North Korea. "Iran continues to be the foremost state sponsor of terror and exert its influence in regional crises in the Mid-East through the Islamic Revolutionary Guard Corps’ Quds Force, its terrorist partner Lebanese Hezbollah, and proxy groups," Clapper said. "Iran and Hezbollah remain a continuing terrorist threat to U.S. interests and partners worldwide." Intelligence sources have predicted that Iran’s hatred for America will not abate despite the nuclear deal championed by the Obama administration. "Iran’s supreme leader continues to view the U.S. as a major threat and we assess his views will not change despite the implementation of the [nuclear] deal, the exchange of detainees, and the release of the 10 sailors," Clapper said. Technology challenges remain for the U.S. as it seeks to disrupt cyber attacks and infiltrate online terror networks. Russia, China, Iran, and North Korea continue to collect sensitive data from hacking American networks, Clapper said. "Targeting collection of the U.S. political, military, economic, and technical information by foreign intelligence services continues unabated," he said. "Russia and China post the greatest threat, followed by Iran and Cuba on a lesser scale." Terrorist groups such as ISIS and al Qaeda have demonstrated an ability to hide their online operations. 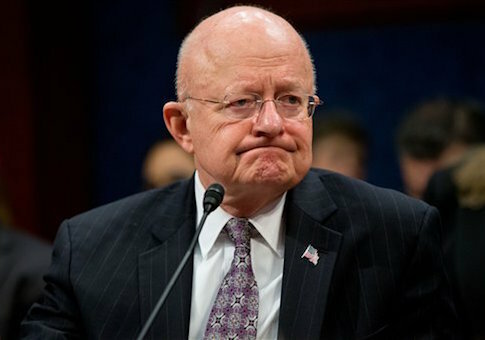 "The increased use by violent extremists of encrypted and secure Internet and mobile-based tech has enabled terrorist actors to go dark and serves to undercut intelligence and law enforcement efforts," Clapper said. Rep. Devin Nunes (R., Calif.), the intelligence committee’s chairman, expressed concern over the government’s ability to address all of these threats. "The U.S. faces the highest threat level since the 9/11 attacks," he said. "The intelligence community is being stretched thin and is overwhelmed by a complex threat matrix." Nunes also highlighted several instances of waste, fraud, and abuse in the U.S. defense network. Whistleblowers have informed Congress that officials at U.S. Central Command have deleted "both files and emails" to hide them from lawmakers. Additionally, sources have identified billions of dollars in waste and excess spending for programs, including "documentation showing the Department of Defense has provided false information to Congress." Several congressional committees are currently investigating this behavior. This entry was posted in National Security and tagged China, Cuba, Iran, ISIS, James Clapper, Russia, Terrorism. Bookmark the permalink.